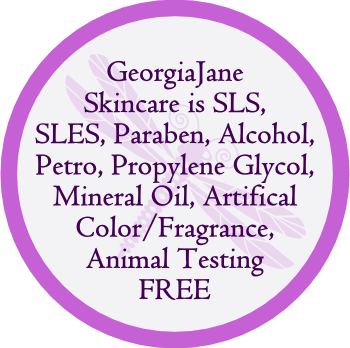 Every woman wants the same thing, Clean, Clear, Healthy and Luminescent Skin and GeorgiaJane Skincare achieves this without sacrificing luxury, quality and efficacy. We develop and manufacture powerful multiactive 100% natural skincare products with well thought out considered ingredients at clinically proven effective concentrations and included for their specific properties. Hand made in small batches under strict controls, using safe but potent ingredients to treat, tone, protect, sooth and renew your skin. Helping it to become luminous, healthy, hydrated with a gorgeous natural clarity. – Pre-made bases of any kind. Any colour comes directly from the botanicals the products contain. Any scent where it is present comes from pure essential oils chosen not only for their perfume but for what therapeutic properties they can bring to the formula. All our products have only been tested on humans!